UPDATE: 20 Oct 2008 - have spent some time playing with both handsets, and even more time looking at Windows Mobile as a whole. Since I travel a lot, and will not be buying a handset as part of a plan or contract, I'll be buying an unlocked, full retail price device - and have decided to wait a little longer before taking the plunge. The HTC Diamond Pro suffers from Windows Mobile's clunkiness once you get beneath 'touch flow'. And I can't get past the dialler problem (which not only Nokia solves, but so do both Samsung and Sony Ericsson, each with copy or send to dialer options). As for the Nokia N96 - they have taken the N81 (and other) style handset, made it wider and thicker for the N96 - and it just doesn't work - feels flimsy and cheap - and definitely not right for the price tag. 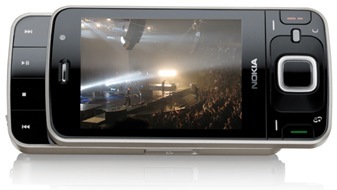 Nokia really needs to lift their design game, or another player is going to knock them from their number 1 spot. In fact the Samsung INNOV8 (i8510) is already a viable alternative to the N96, and the future of Android based handsets looks very interesting indeed. UPDATE: 09 Sept 2008 - saw a demo model of the Nokia N96 today - not a working model - just one of the mock-ups they use to show size, design etc. in the shops. Not looking good for the Nokia. The aluminium ring surrounding the front bezel looked very cheap and lightweight. Will wait of course until the real-deal is in the shops.. but it looks like they've produced yet another design that is not consistent with the price tag... we'll see - may have just been the mock-up. Getting close to that time again where I'll be in the market for a new mobile device. About a year ago I dropped back to a POT (plain old telephone) mobile handset - a very basic Nokia 3110c. I had decided to reign in my gadget attachment disorder and wait another generation or two before moving back into the world of multifunction/media/pda/smart phones. My previous experience wasn't great. A couple of years ago I bought an HTC Wizard - the Qtek 9100 version. Initially I was impressed - and really liked the QWERTY keyboard. But after a couple of very bumpy ROM updates, major disappointment with the Windows Mobile dialer (which continues to this day) and big problems with screen calibration as well as using the touch screen in hot weather - I gave up. Windows Mobile 5 wasn't there yet - just didn't feel right; that combined with my first HTC experience and I figured waiting it out a generation or two was a better idea. Fast forward to August 2008 - and my choice has narrowed (I think) to the Nokia N96 vs.the HTC Touch Pro. As an aside - the Apple iPhone is definitely a game changing phone - a very cool device, and I would love to put my hands on one. But I just can't understand why they don't sell both unlocked versions, and the freedom to choose any media player I like. I refuse to use iTunes, and as Jeff Atwood has remarked - Apple hardware is in reality just a dongle for all your software. Really - I'm especially confused by the locking issue and wonder why trading standards bodies haven't intervened. Anyway - back to the shootout. There are - broadly speaking - two groups of mobile device users. Those who want phones with some extra bits including a PDA, and those who want a PDA with a phone. I'm definitely in the "give me a phone that works" camp, and then I'll look at the extras bits second. The Nokia N96 is in the 'phone first' category as far as I'm concerned, while the HTC Touch Pro has more of a PDA lineage. On the Nokia side, one thing that has really impressed me is the huge improvements they've made in PC client and synchronization software over the years. The Nokia PC Suite just gets better and better. They've adopted a universal client application strategy which makes a lot of sense. Just one download for all your Nokia phones (your own and your friends' should they want to connect to your PC to transfer files, photos etc). Very easy to install, configure and use and it's worked well for me in terms of synching my contacts and diary with Outlook - which at the moment is about the limit of my PDA needs (although this could change when I finish studies and head back into full-time employment). The Nokia OS - both the 'Nokia OS' and Symbian versions - have always been stable and easy to use. The general consensus seems to be that Nokia's operating systems have been more stable and less power hungry when compared to Windows Mobile devices - although the gap in this respect is narrowing no doubt. To me the only downside to Nokia has been the consistency which which they seem to produce flimsy, ugly, and generally very poor designs. On many of their models I find the buttons and plastic components feel rather cheap and certainly not as firm or positive as I think they should be in the more expensive models - especially the number pads. I was VERY close to taking the plunge on an N95 - but then heard about the N95 8GB and decided to wait. In terms of design at least the N95 8GB was a big disappointment and a step back from the N95. Very flimsy button action, a crowded central button panel and certainly not the look and feel of a 400 GBP, or 650+ USD mobile device. What a shame. Enter the N96 - I've yet to put my hands on one - but it looks great - and if the design improvements and positive reviews so far live up to expectations this looks set to be a brilliant device. 16GB storage, quad-band, WiFi, micro-SD, GPS and lots else. I've wanted to play with a GPS system for a while as well, although not sure yet whether this will just be the "toy in the phone", or something useful. Enter the HTC Touch Pro. I took a quick look at the HTC Touch Diamond while I was in Hong Kong a month ago - and it looked and felt pretty good. I also remember how cool it was having a good QWERTY keyboard in a mobile device during my early days with the HTC Wizard. 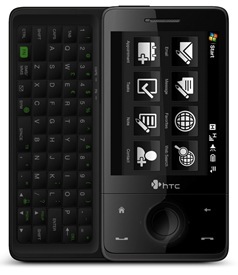 The HTC Touch Pro has a full five row QWERTY keyboard so typing numbers will be much easier. Windows Mobile 6.1 Pro, Quad-band, WiFi, GPS and an FM radio plus lots more. I'm really looking forward to putting my hands on one of these as well to see if the build quality, keyboard, UI etc. live up to the price tag. That said, and as crazy as this sounds - the Windows Mobile dialer may still be the show stopper. I blogged before on this topic. The problem is that there isn't a way to take a telephone number from a contact, load it into the dialer, and make ad-hoc changes to the number before you dial (like dialing prefixes, dial out extensions, calling cards etc). This is a standard feature on all Nokia devices - the 'Use Number' option. On the other hand - developing software for WM is reportedly easier than for the Symbian OS - so maybe writing a custom dialer will be my first WM dev exercise. Another deciding factor between the two is the choice in application software. Since I'm still in the 'phone first' camp - this isn't a critical area for me although I do want good support for mail, IM, VoIP and even a decent Twitter client. Initially I was concerned about Symbian support in this area - but having found both Gizmo (a very cool universal SIP based IM and VoIP client), as well as Fring (another very cool universal IM client with Twitter support) I think I'll be ok if I decide to go with the Nokia. In either case these are both Q3, Q4 devices in this part of the world - so it will be interesting to watch the reviews shape up and see how the two fare before making a final decision. In the longer term (and unless projects like OpenMoko and the Neo Freerunner really start to gain market share) - I'll almost certainly be headed over to Windows Mobile Android. Either I or MS will fix the dialer, and the opportunity to easily build client apps that fit nicely into LOB and other connected systems will make Windows Mobile hard to resist as a development platform for much longer. some cool looking phones, can't wait for the rest of the world to catch up and surpass the iphone, it's overdue.